23a, PUSH YOUR LUCK [Ask the boss for more vacation time after getting a raise, perhaps]. Instantly made me think of the bygone game show Press Your Luck, which would’ve been more fun. If you’ve never heard of Michael Larson, the contestant who gamed Press Your Luck to the tune of six figures, check this link out. 34a, PIN ONE’S EARS BACK [Scold a person]. I don’t like that there are two themers, one of which uses “your” and one of which uses “one’s.” It would’ve been nice to keep those consistent, though it would’ve broken the theme. I do like the phrase, even though it doesn’t seem to be exceptionally common. 50a, PLYMOUTH ROCK [Landmark with the year 1620 inscribed on it]. My favorite of the themers. 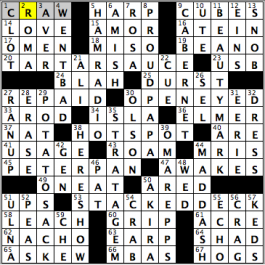 59a, PULLED PORK [Messy sandwich filler … or a hint to this puzzle’s circled letters]. In case you hadn’t figured it out yet, each of the four theme answers has the circled letters PORK. They all start with P and end with K, and the O and the R are pulled at least one space away from the rest. 6a, SMIT [Goo-goo-eyed, old-style]. “Goo-goo-eyed, old-style?” I have to say, I never thought I would see that permutation of words. 16a, OH TO [“__ be in England” (Browning line)]. I’m trying to decide whether (Browning line) would ever be used after an Elizabeth Barrett Browning quote. So far it hasn’t happened in the NYT (she gets either full name or E.B. Browning). I’m wondering whether it’s because “Barrett Browning” would be preferred to Browning, or whether it’s because there’s a subconscious tendency to assume the male Browning unless otherwise specified. [Org. 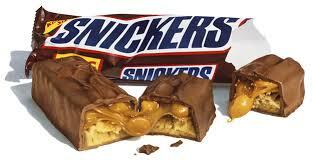 for “King James”] is a nice clue for 29a, NBA. I’m sure some hundred-thousandaires will be writing into Will this week to complain about 41a, YACHT [Millionaire’s vessel]. 54a, UELE [River to the Ubangi]. You have to be in dire straits to drop UELE into the grid. Tough section to fill, but I’d rather drop a theme answer than have UELE. 32d, GET [Word cried before “on it” or “lost”]. Does anyone cry “Get on it!”? Share in the comments below if you do. 35d, NABOB [“Nattering” sort in a Spiro Agnew speech]. I feel like a nattering nabob of negativism writing this post. 51d, MINOT [North Dakota city with a nearby Air Force base]. The crossings are fair, and hey, if TRURO and ORONO and TIOGA can be in the puzzle, why not MINOT? 59d, PIN [A.T.M. requirement]. The dupe between this PIN and the one in PIN ONE’S EARS BACK felt really noticeable to me, even though they’re clued in two different senses. It’s especially bad given that PIP/POSE is available as an alternate fill. In the same vein, LAPP is kind of an outdated demonym — changing the L to a C (CAPP/COINS) would have helped, or LAPS/SAN instead of LAPP/PAN, or both changes (CAPS/SAN/COINS). This one just wasn’t my cup of TEAS. Until next time! 41A [“Win ___ With Tad Hamilton!” (2004 romantic comedy)] A DATE – On my list of movies to watch that I’ve never seen! OK, not really. 43A [Visnjic of “ER”] GORAN – I have never seen ER either, but I knew this guy right away. As a tennis fan, I was a fan of GORAN Ivanisevic. Either one works. 55A [Austin Powers’s “power”] MOJO – “I’ve lost my mojo!” If I had a dime for how many times I’ve said that … I wouldn’t have any money! 72A [Beauty brand that happens to anagram to another brand in this puzzle] NIVEA – This is genius. I would never have caught this. I wonder if it was on purpose. The other brand is EVIAN at 19D [Aquafina competitor]. I actually had to hunt this down! I am not a fan of connected clues, but this is well done. 4D [“Just ad-lib if you have to”] GO WITH IT – Great entry. Seems like a very common phrase to me. Awesome. 25D [“___ a biscuit”] SON OF – Sadly, another common phrase! 35D [Big name in the kitchen] AMANA – Where would crosswords be without this company? Some constructor should create a start-up and name it AAAE. 47D [Instructions to a violinist] UP-BOW – I need to go to the symphony more. Seriously. Another great Jonesin’. Fun to solve, as usual. 3.9 stars. Made me laugh! 55A [Smelled a lot] STANK – Unpleasant imagery, depending on what you think of, but that’s OK! 63A [Old-style “once”] ERST – The only crosswordese-ish answer that is relatively obscure. But the word “erstwhile” is still fairly common, so if this is the most cringe-worthy entry, he’s done a fine job! 68A [Actor Romero] CESAR – Now I feel like watching old Batman reruns, with Cesar Romero as the Joker! 10D [Large edible fruit] PAPAW – OK, so there are TWO obscure entries! At least to me. I would have clued this as [Nana or Nanny’s mate] or something to that effect. Don’t people call their granddad’s this? 37D [Poet Khayyàm] OMAR – Actor OMAR Epps has become crossword famous. 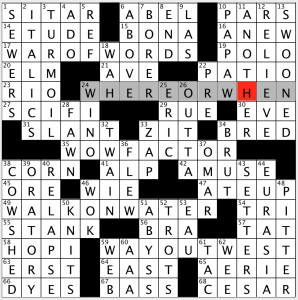 This clue seems more … literary! 38D [Bovine shelter] COW SHED – I suppose if you put cows in a shed, then it would be a cow shed. I thought they went in a barn! 39D [Cicero’s skill] ORATORY – I had ORATION in there at first. I was on the right track! Gareth, nice puzzle. Keep up the fine work! Where to begin with this puzzle’s many ASSETS? Lemme cut right to the chase and talk about those themers. Each provides great fill its own right—lively phrases all, with lotso variety—and each contains a word that describes a kind of “bar.” (On your solving screen or your print-out, these are contained in the circles; in today’s graphic, they’re within the colored squares.) Two of those bars are associated with drinking, two with eating, one with a term that may be seen in law, publishing or computing—so lotso variety here, too. 17A. CHAOS THEORY [The “butterfly effect” is a tenet of this physics class subject]. And something that folks who like the idea of time travel may be fascinated by (so be careful what ya do when you go back!). cash bar. 23A. SWEET TALK [Flattery from one’s honey?]. A little has been known to go a long way… wet bar. 36A. VERTICAL FARMING [Agricultural system that’s skyscraper-based]. First of all, is that grid-spanner fabulous fill or what? It’s a national movement (and not just in “big cities”) and it’s in the news, oh, just about all the time it seems. clam bar. 50A. REAL WORLD [Practical, as work experience]. (With “the”), that place our parents always want(ed) us to prepare for… raw bar (which, depending on its size might include a discrete clam bar). 59A. BASS FIDDLES [Country band’s bottom-line investments?]. Great. Clue. And, most interestingly (cue up the Law & Order sound effect), side bar. Solving first and looking at the title last, I dubbed this terrific puzzle “Raising the Bar.” But for any number of reasons “Bar Hopping” is definitely the stronger moniker. For one, it suggests the conviviality of social drinking; but the real reason it’s a stronger title has to do with the way the kinds of bars are placed both within and between the themers. Within: we hop from circled letter to circled letter (skipping only one letter in each instance); between: take a look at the near step-down effect created by the way the circled words appear in the GRID. This is one lovely visual “extra.” Then, I also like the way we alternate—hop, if you will—between bars of four and three letters. All of this gives the puzzle a great deal of internal integrity. Was recently down in Baltimore where the famous COSTAS is not so much sportscaster Bob, but down-home seafood restaurant and crab house extraordinaire, Costas Inn. If you’re anywhere in the vicinity and have a hankering for, say, hard shells, they make a visit well worth your while! While you can expect to hear some fine live jazz, this is not an establishment where you’re likely to find CRONUTS on the menu. No, they’ll be found in more refined EMPORIA. And while it’s no INFERNO, without question (and sans question mark) [It’s a helluva place?]. Like last week, I felt some of the question-marked clues failed to offer the satisfying twist those clues promise. [Perform well at the barber shop?] for CUT IT and [Clean one’s clock?] for WIPE, even [Bum muscles?] for GLUTEI miss the mark for me by feeling forced. And maybe I’m missing something, but what makes complaining on Facebook unique to the [AIR A grievance…] clue in its entirety? I think I’d be more inclined to buy it if it read [AIR A grievance (complain on Facebook, say)]. You can complain/AIR A grievance any number of ways: to your mother, at the customer service window, on Yelp for that matter. And that’s just for starters. As always, ymmv. And with that thought, I’m gonna SCRAM. Great seeing so many friends and Fiendsters at the rockin’ Lollapuzzoola 8 this past weekend! 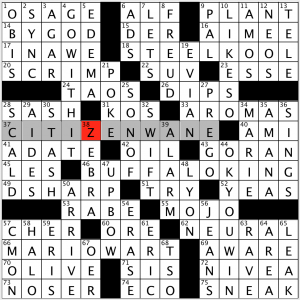 Good morning, crossword lovers! I hope you’re doing very well today. Now before I go on and review today’s puzzle, I have to share with you this unreal and amazing story that occurred to me last night! Last night, while shopping for a couple of new crossword puzzle books from Barnes & Noble, a lady soon wandered to the same shelf and also was looking through the selection of crossword puzzle books. I noticed her looking at the “challenging” crossword puzzle book section, so I commented to her, “Going for the hard ones off the bat, huh?” After some small talk, she asked me that her grandfather is a popular crossword puzzle entry. After that, she asked me, “You know Mel Ott, right?” Yes, I had just met the granddaughter of New York Giants baseball legend – and very, very frequent crossword puzzle entry – Mel Ott last night! How awesome is that?! Somehow, though, the story has another odd twist. What was I wearing at the time of meeting Mel Ott’s granddaughter? Nothing other than a Brooklyn Dodgers shirt, the team that’s the eternal enemy of the New York/San Francisco Giants. Literally, the irony just smacked me in the face with an open palm! The things that happen when you’re living in New York! Don’t have too much to say, and it’s not because I don’t like the puzzle, which I did. Already emptied my ammo telling you the story that I had last night. Also, I’m in Montréal as we speak, covering – or, at least hoping to cover – the men’s tennis event that’s currently taking place! At the moment, it’s raining cats and dogs here in Montréal, and the whole day is turning into a washout even though I still have to head to the stadium and pick up a credential. Definitely beyond frustrating for sure! But tomorrow, I promise, I’ll talk about the actual grid in detail. “Sports will make you smarter” moment of the day: OLSON (30D: [Classic game show announcer Johnny of “The Price Is Right”]) – In 1989, former Major League Baseball pitcher Gregg OLSON became the first relief pitcher to win the American League Rookie of the Year, setting an American League rookie record with 27 saves. The season after, in 1990, Olson made his one and only All-Star team. Olson ended his career with 217 saves. This entry was posted in Daily Puzzles and tagged Daniel Kantor, Donna S. Levin, Elizabeth C. Gorski, Gareth Bain, Jay Kaskel, Matt Jones. Bookmark the permalink. NYT: cheese yesterday, pulled pork today! The Vegans need to scream equal time. We need a quinoa puzzle! Meanwhile, I have the best recipe for making pulled pork in the slow cooker… Pretty amazing and I’m not much of a pork eater. The puzzle was made easy by figuring out that PORK is in the circles of every theme answer– a great help given some of the fill– UELE and such. 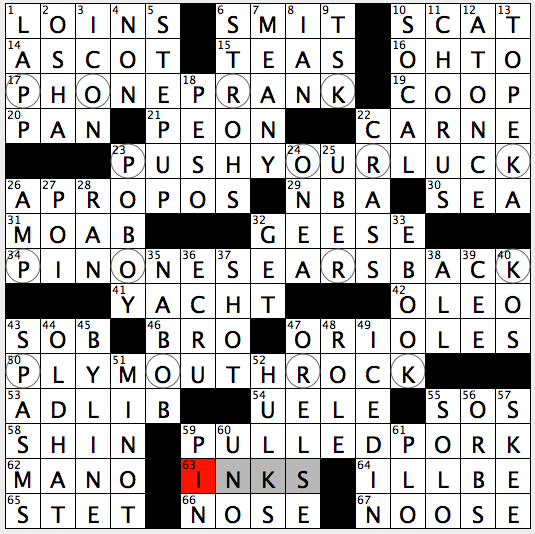 For as much as you were lukewarm about it, you were still far too kind to today’s NYT puzzle. PINONESEARSBACK doesn’t work, IMO. In a phrase like this, ONE’S has to be reflexive — that is, it refers to the person doing the action. So one would pin one’s own ears back, whatever that might mean. But in fact person A pins back the ears of person B. You — I mean one — would have to say PINSOMEONESEARSBACK. Your post went up while I was typing mine – you put it much more eloquently than I did. “One” is third person, although it can be used as first person (as in “one doesn’t have the time for all these puzzles”). I follow what you’re saying, but I’m not sure it applies here. In the Twain quote, isn’t it still addressing what the person (“one”) is doing himself/herself? There might be something I’m missing, and I don’t have the grammarian (?) background to describe exactly why I disagree. Maybe David L (or pannonica) could weigh in. If you’re watching another person playing “Pin the Tail on the Donkey” and, in reaction to that person sticking a caged canary, you might say, “One needs to be more careful with one’s aim.” Context makes it clear you are talking in the third person. On the other hand, if you are the blindfolded one and stick the bird and then say, “One needs to be more careful,” it’s clear you’re referring to yourself. It’s still a third-person pronoun but it may be used formally or ironically in the first person. You know by context. I don’t know why so many people are expressing the opinion that “one” is always reflexive (first person). It’s not true. I don’t dispute that such a construction might make sense, I just don’t think that it’s “in the language,” as is so often cited here. I suppose that although “wipes one’s nose” might describe what a parent does for his/her child, common usage would consider it to be what one does for oneself. And my original comment was based on how “pin one’s ears back” would be interpreted in common language. I didn’t see the rest of this exchange until this morning. “One” is grammatically third-person, but can act as a first person pronoun, in the Prince Charles sense: One has always been conscious of one’s role in society. But that’s not the point here. Being reflexive has nothing to do with first person, third person, or anything else. In a phrase like “stand on one’s own two feet,” the “one” is clearly the person doing the standing, i.e. the subject of the verb ‘stand.’ One stands on one’s own two feet. But if you use a phrase like ‘send to the woodshed,’ the person doing the sending and the person being sent are different. That’s why it would make no sense to say “send one to the woodshed” as a generic version of the phrase. One sends one to the woodshed. Nope. I’m more familiar with “ears pinned back” in a sports context. My high school basketball coach, after a severe thumping by an opponent, used to tell us that “we really got our ears pinned back.” But I can see how it might work as a description of a scolding, too. I agree, I struggled with ONE’S in that answer. Using ONE is not lovely to begin with, but it also seemed off. I’m also with Andy that it felt inconsistent to have ONE and YOUR in two theme answers. PIN in a theme answer and PIN in the grid? I realize the latter is an acronym but it still seemed odd. Just one of many reasons to dislike this puzzle. It was so nice meeting you, Ade!! It really is a small world sometimes! And thank you for all the excellent crossword information and advice . . . I never got to meet him myself (he was killed in a car accident years before I was born), but from everything I hear from all who knew him, he really was as wonderful a person as he was reputed to be – in addition to being an amazing player, of course! 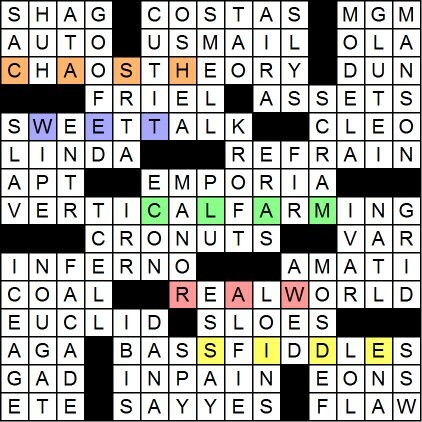 Ade, thanks for the review of my puzzle, but it looks like you missed the fifth theme entry that was in the middle: HOT SPOT. Oh, well. Next time, I’ll try to make the theme entries more transparent. No, you don’t need to make the theme entries more transparent one bit. You just need to make the blogger less sleep-deprived and more aware! Thank you for creating the puzzle, as well as noting the omission. I’m pretty sure that I’m good for a brain lock when blogging about a grid at least once every couple of weeks!